Ever since the honourable president announced the vision for a slum-free  India this had been the limelight of discussion in the intelligentsia in social, and urban development field. One of the most shocking revelations came when the Parekh Committee stated that five years were too less for this dream to come true. Even so, the positive side to this was that those five years were the first phase for the realization of the dream. By following a structured methodology, this dream is quite achievable. There are a few myths that need to be broken off before we proceed, and there needs to be a paradigm shift. ARE SLUMS REALLY A BAD PLACE TO LIVE IN? When we say slums, we talk about a place which more than 93 million  people call their home. When India has an upper hand in the global economy through a demographic dividend, every eighth child up to six years-old lives in a slum; thus, making the situation grave. However, before we set to solve the problem we need to have a better understanding of the problem itself. Undoubtedly, slums have many negative things, but there are many positives to it, which we need to preserve. Preservation of these positives is all the more important; even majority of the planned development in urban India, lacks them. 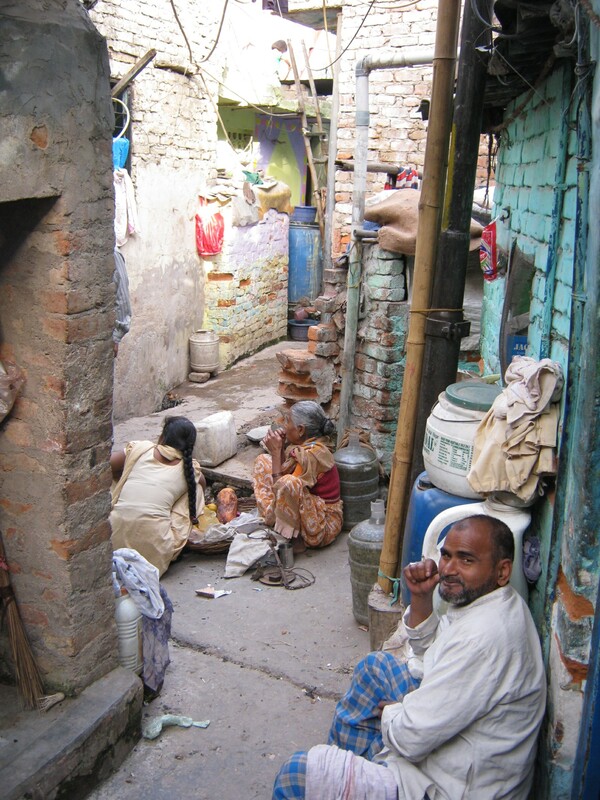 Slums in general have an intricate social structure. The organic nature of the slums helps in building strong interpersonal relationships. It should be noted that in current times one even refuse to recognise the next door neighbour in an apartment while an entire gully in a slum lives like a family . 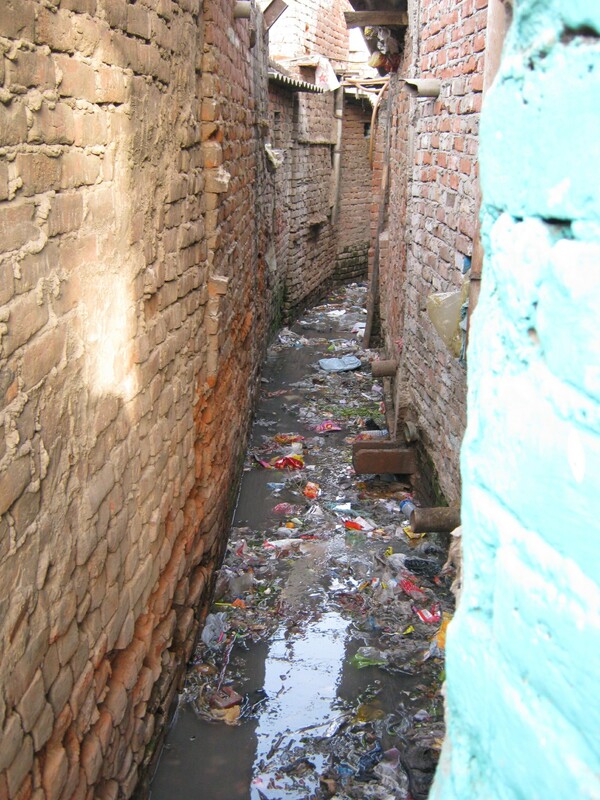 The alley (gully) in a slum is the most vibrant and important open space. During the different times of a day, the street transforms itself into various functions according to the needs of the occupants, acting like a strong social spine for the community within and the neighbouring locality. EXAMPLE: Major community interaction happens on the street. Women dominate the street in the mornings sharing the space for daily activities – from washing clothes to cutting vegetables. In the afternoons, the kids who return from school play in the gully where every member of the community can keep an eye on them. By evening, the male members sit outside and discuss work . One of the most talked about slum redevelopment is Maharashtra’s SRA schemes where the builder gets the right to the land after the completion of houses for the slum dwellers. Taking from SRA schemes in Pune, the flats created for the slum dwellers completely ignore the social structure. One of the main reasons for this to happen is because there is no participatory planning process. The SRA scheme has a very good process in place for informing the slum dwellers on what they are getting, but there is no process in place for the community to get involved at the design stage; thus the resulting design is the outcome of an architect’s vision who has never lived the way the community lives. A stark difference can be seen in the city of Sangli, just coupleof hours from Pune; where an NGO ‘Shelter Associates’ have involved the community in the design process through GIS and other architectural tools. The design of new homes for slum dwellers in Sangli demonstrates how the social structure of the community can be enhanced by the involvement of the community which thereby improves the local environment. EXAMPLE: In a typical architectural logic, interiors of a house should not be visible to the other house, so generally apartments and flats are staggered to avoid the entrances facing each other, which is a good design practice in usual scenario. 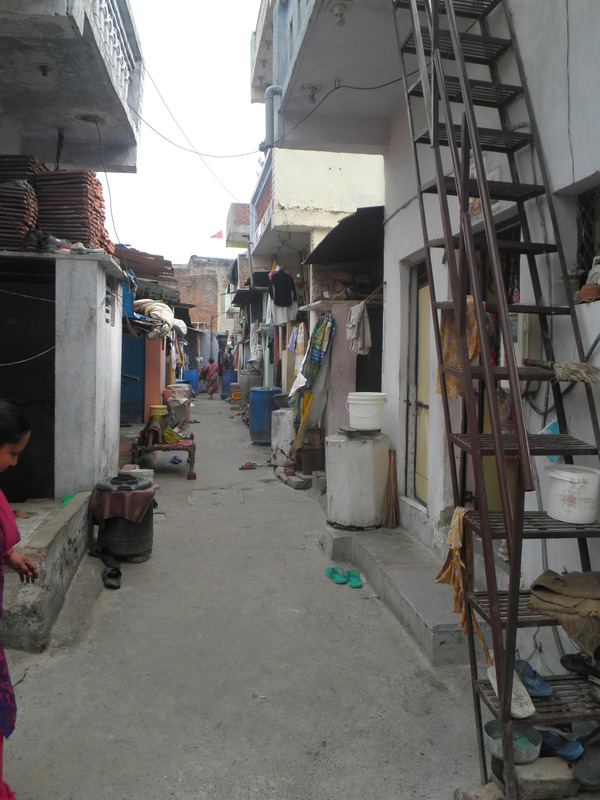 However, experience from the slums clearly shows that the first level of the interior space of a house in a slum is permeable and needs community access. This particular issue and many other such nuances are unacceptable for a normal architectural mind, and therefore, the community needs to be involved in the design from the beginning. Rajiv Awas Yojana (RAY) has a very detailed chapter on community participation, also it requires 70% community consensus for a project to go ahead. However, the biggest road block for this is the lack of capacity in ULBs, also there is only a handful of CBOs working in the housing sector which aggravates this problem. The proportions of different types in this heterogeneous entity vary from place to place in a city itself. This mixed character needs to be preserved whenever an intervention is done in a slum. EXAMPLE: JNNURM established the minimum size for a dwelling to be 25 sq m. But what is more important and determines the quality of life in a dwelling unit is the per person area. Many slums have 6-10 people staying in a house, thus providing them with a 25 sq m house means that one person gets a maximum of 4 sq m, which is worse than providing a 15 sq m room for single occupancy. Thus, any slum redevelopment project should consider a mix of different housing typologies that need to be incorporated. Based on the location, there should be a mix of typologies between dormitories to joint family units. As the general rule goes: almost always there is no one who is unemployed in a slum! One of the main reasons for the focus of in situ redevelopment in RAY is to retain the livelihood options of the community which has developed over the years. Keeping the location intact is not an action enough to keep the livelihood of the community. Slums in general have a varied occupational involvement and in that regard, every slum is different from each other. While designing for a slum the spatial needs for these occupations and its related activities need to be taken care of individually. EXAMPLE: Every slum is involved in different economic activities. 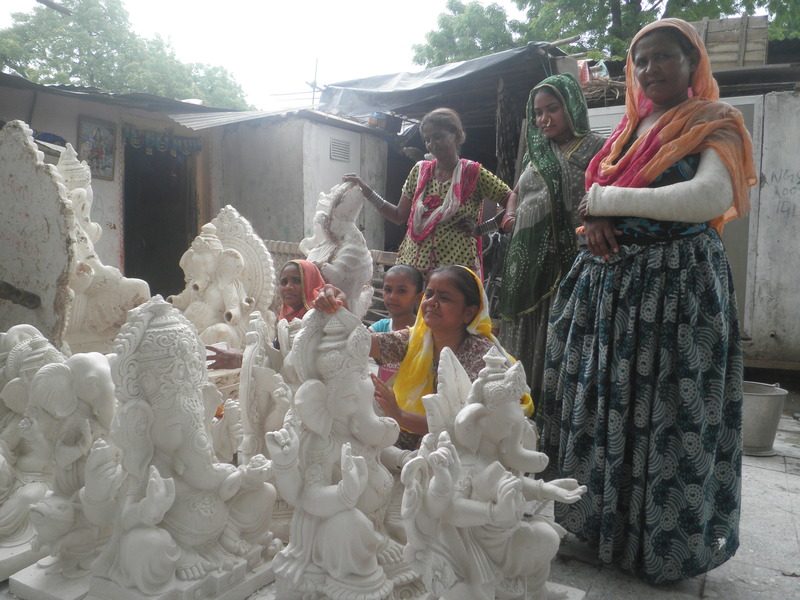 The slum of Sunder Nagari in Delhi is extremely a shoe making community. Each house is a mini factory and loads of different-sized shoes are produced in each house, thus there is a need for different spatial design of these houses in case of redevelopment. Similarly, Gulbai Tekra in Ahmadabad mainly consists of sculptors. Now this is a different case from Sunder Nagari because in Gulbai Tekra, the houses are normal, but the community space (or the clustering of the houses) is articulated in a manner to create workshops for these artifacts. Furthermore, there are special spatial requirements like protecting the sculptures from sun and rain. 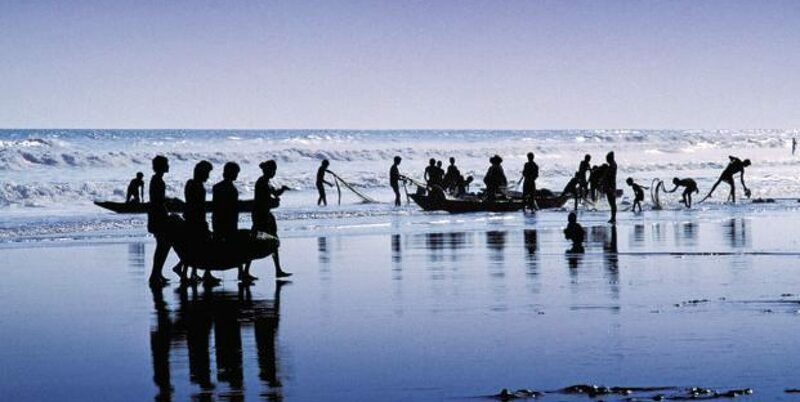 These examples are presented to emphasise that there is more to livelihood than location. When one talks about getting rid of the slums, then it is a huge number; the magnitude of it itself is enough to understand that simply eradicating slums and rebuilding from scratch will never solve the issue. As of now India has very limited resources and limited time to achieve the goal, thus we need to concentrate on improving the conditions of the existing stock and build new stock. For the initial first phase there need to be a strategic approach towards the slums; it is Utopian and unachievable to look forward towards completely rebuilding each and every slum in India. A participatory approach with the community private players and experts in this field should be applied. 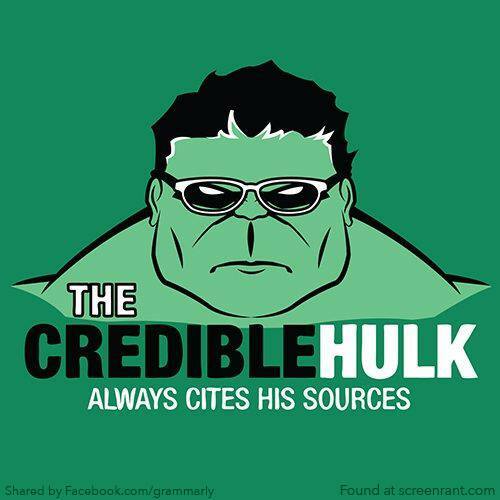 Thus it makes complete sense to first tackle these issues. Health-related issues are predominant in the slums, so a sanitation plan needs to be made with community participation. A multidisciplinary team  with the help of a community-based organization shall be involved in this process. Community knowledge can be used regarding the flooding pattern and local bottlenecks for devising an efficient servicing system without demolishing existing houses. With a sanitation network in place, it becomes easy for laying water and electricity lines taking safety into consideration. Structural safety and quality of dwelling units are a tricky issue. Most of the slums are self constructed, thus the best way to influence the quality of these structures is through training masons. Masons have a trust factor in these communities and imparting basic knowledge of quality construction practices and rules to them will have a big impact. 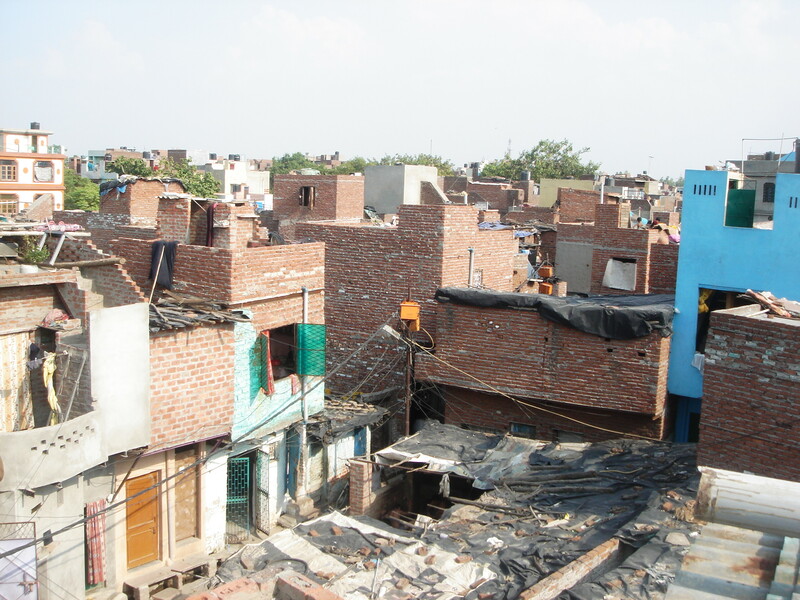 EXAMPLE: Indore and Ahmadabad have implemented a successful slum networking program (SNP), which is a partial example of a conservative surgery approach. Sharif Khan Pathan ni Chaali in Ahmadabad was one of the first few slums to be tested with SNP. Basic services and sanitation were laid with community involvement through the NGO SEWA-MHT and the work completed in 2000. After the SNP program there has been a considerable increase in investment in the improvement of the quality of the houses by slum dwellers themselves. Moreover, the quality of life has tremendously increased after the initiative. India has a housing deficit of 25 million and 98% of this deficit is in EWS category; and with 2.07 % urban growth rate this deficit is bound to increase. Thus, there is no option but to add to the housing stock. Subsidised houses or free houses create perverse incentives, and the repercussions are known to everyone. Instead there should be a diverse option for all the income levels and family types. Everyone need not own a house. If a person is economically weak, then there should be an affordable rental option available, rather than subsidising a house for ownership, the subsidy should go into the process of establishing affordable rental options. The new development should allow community management through the creation of cooperatives. In terms of owning a house, those who can access finance (or self-finance) can own a house directly and those who are not can also be given a choice on rent to ownership model. In order to achieve the dream of a slum-free India, we need to be innovative and be practical in our approach. Terms like cut-off-date need to be removed and an approach based on self-selection should be developed for the slum dwellers. Initiatives should be devised, which could become a catalyst for quality improvement and any initiative should be judged through a social equity lens. Hope we soon have better and adequate housing for all. This and further observations in this article on communities in slums is based on authors experience in studying slums in different parts of India. Based on study of street activity in the slums of ‘Sunder Nagari’ in Delhi and ‘Baba Lui Jhoparpatti’ in Ahmadabad by the author. AhemadabadDelhiEcoenvironmentFood for ThoughtHabitat for HumanityHousingIndiaJawaharlal Nehru National Urban Renewal MissionMaharashtraNipeshNipesh NarayananNippoParticipatory DevelopmentpostadaySangliSlumSlum free IndiaSlum RedevelopmentThis is lifetvarajUnited Nations Human Settlements ProgrammeUrban planningUrban Thoughts.